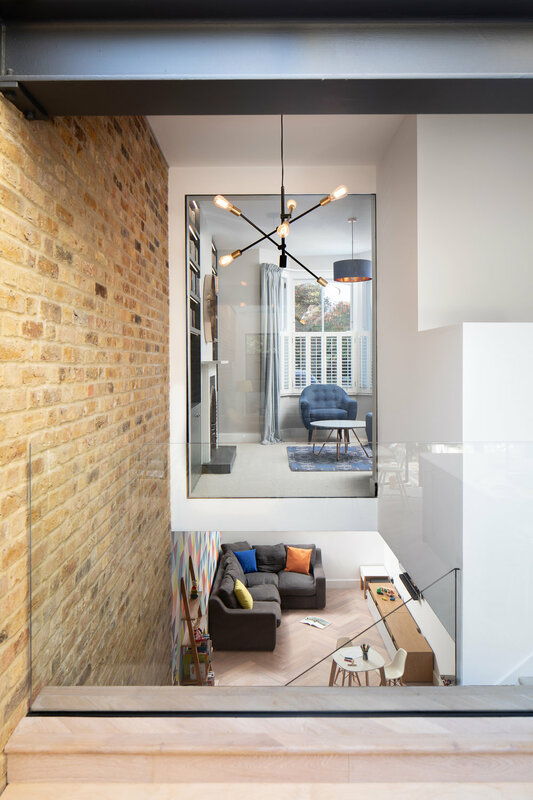 Sketch Architects have refurbished a terraced home in South West London by adding a spacious, bright rear extension with large glazed doors extending into the garden and a usable, playful basement room. The brief presented to Sketch Architects requested that the available space within this small terraced house be maximized. The existing building had already been extended with a partial side return, but each space was cramped and felt separated from the next and the layout wasn't working for the young family who lived there.The client asked Sketch Architects to investigate options that created a larger sense of space, utilising and increasing the existing small cellar, whilst maintaining a connection to the rest of the ground floor. To achieve this Sketch Architects introduced a double height space in the centre of the ground floor plan to allow light in from a new glass roof at the rear, with additional walk on glass at the front of the house. Basements can all too often feel dark and isolated from the main house above but here we have instilled a sense of light and connection, creating an inviting space linked to the rest of the house. The floor of the kitchen at the rear of the property was lowered both to enhance the flow into the garden with a level threshold and to increase the lines of sight into the basement. Exposed steels allowed us to remove many internal walls, maximising sight lines diagonally from front to back with cleverly located pocket doors allowing spaces to be divided when necessary, but seamlessly open and light at other times. The front reception room was reinstated to its original dimensions but with a full height glass wall overlooking the double height space maintaining the visual connection with the rest of the house. Re-configuring the existing main stairs allowed the introduction of a number of innovative storage ideas, maximising the use of space. The hallway now feels wider and uncluttered despite the challenges of accommodating family life. Throughout the house we have used a number of natural materials; exposed bricks, painted steels, glass and wood. In the kitchen and basement we have created storage using birch ply and upstairs added an office space on the landing continuing the use of plywood for the desk built into the eaves with large roof lights overhead.